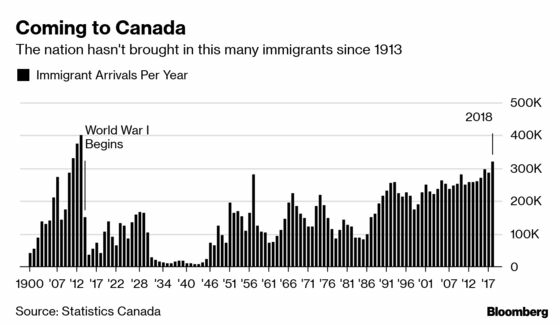 (Bloomberg) -- Canada just recorded its biggest influx of immigrants in more than a century. The country added 71,131 immigrants in the final three months of 2018, for a full year increase of 321,065, according to the latest estimates released Thursday by Statistics Canada in Ottawa. The annual increase is the largest since 1913 -- when 401,000 immigrants flocked to the country -- and the fourth largest in historical data going back to 1852. The increase in international migration, for example, has helped fuel a surge in employment -- even amid sluggish indicators in other parts of the economy -- since immigrants tend to be of working age. Including other forms of migration such as non-permanent residents, the country recorded a 425,245 increase in international migration last year -- the largest in data going back to 1972.